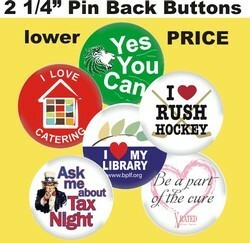 Ever wanted to use custom buttons for your business or special event but didn't need to order 200 - 300? Mustard Seed Promotions can provide you with the popular 2-1/4" size, pin back from 5 - 100 pieces. So if you need a low quantity, give us a call for more information.